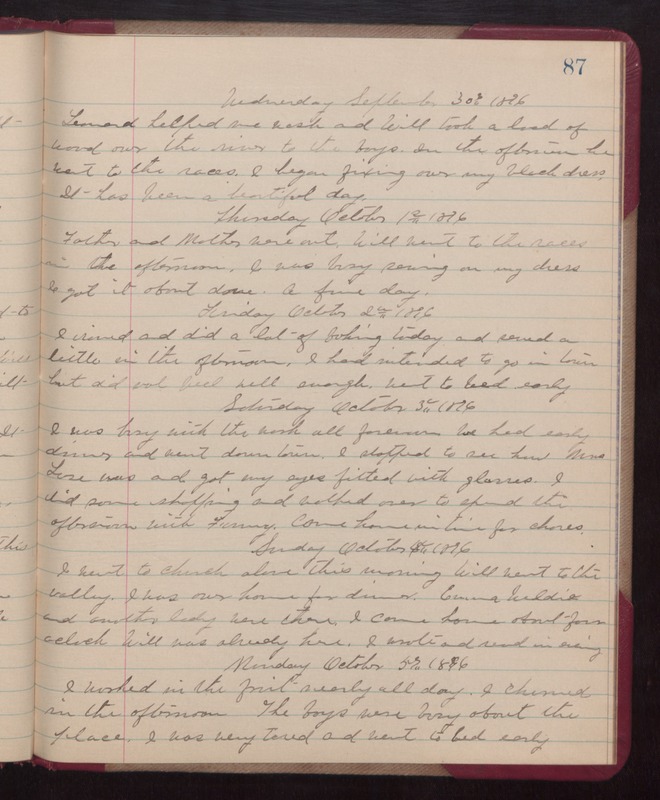 Wednesday September 30th 1896 Leonard helped me wash and Will took a load of wood over the river to the boys. In the afternoon he went to the races. I began fixing over my black dress. It has been a beautiful day. Thursday October 1st 1896 Father and Mother were out. Will went to the races in the afternoon. I was busy sewing on my dress. I got it about done. a fine day. Friday October 2nd 1896 I ironed and did lot of baking today and sewed a little in the afternoon. I had intended to go in town but did not feel well enough. went to bed early. Saturday October 3rd 1896 I was busy with the work all forenoon. We had early dinner and went down town. I stopped to see how Mrs Luse was and got my eyes fitted with glasses. I did some shopping and walked over to spend the afternoon with Fanny. Came home in time for chores. Sunday October 4th 1896 I went to church alone this morning. Will went to the valley. I was over home for dinner. Emma Weldie and another lady were there. I came home about four oclock. Will was already here. I wrote and read in evening. Monday October 5th 1896 I worked in the fruit nearly all day. I churned in the afternoon. The boys were busy about the place. I was very tired and went to bed early.